We want to show you some culture of the bergisches Land („hilly land“) and take you to Schloss Burg! 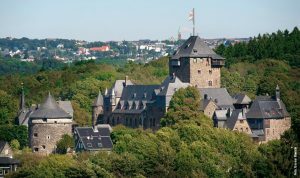 We will have a guided tour of the castle in English and have a nice traditional meal afterwards. Of course you will have some free time to explore the castle on your own. If you want to join us, please come to Stammtisch (Thursday at the Kneipe: Max-Horkheimer-Straße 15, 42119 Wuppertal) and pay the fee. Be quick, as we only have limited spots for you guys. Time: We will meet in front of the Hauptbahnhof at 9:50 am and we will take the Schwebebahn at 10:10.